Inventory We are a resale marketplace, not a box office or venue. Ticket prices may exceed face value. This site is not owned by EagleBank Arena . The EagleBank Arena, formerly the Patriot Center, is home to George Mason University's men's and women's NCAA basketball teams. 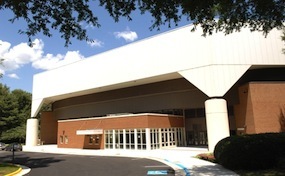 The EagleBank Arena box office is located at 4500 Patriot Circle on the GMU campus in Fairfax, Virginia. The arena opened in 1985 with a seating capacity of 10,000. The Fairfax Center has recently undergone a $10 million renovation to update the facilities and concessions. Some of the most popular EagleBank Arena tickets have included shows by Bruce Springsteen, Phish, Soundgarden, Big Time Rush, and One Direction. The venue was also host to the first UFC event held in the state of Virginia. ArenaFairfax.com is not currently affiliated with any official website, supplier, or box office. We are an independently held and operated company that deals exclusively in the secondary ticket market. Prices on our sites may be well above or below face value and can change quickly with demand. To order tickets to all EagleBank Arena Fairfax events please follow the steps online through the checkout or call our operators at anytime.